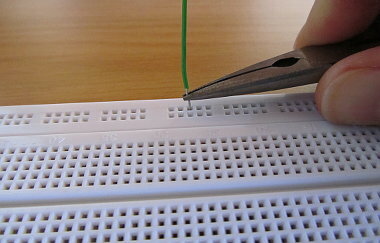 Sometimes it is difficult to insert components or jumper wires into an electronic breadboard because the holes or tie points on the breadboard are too tight. 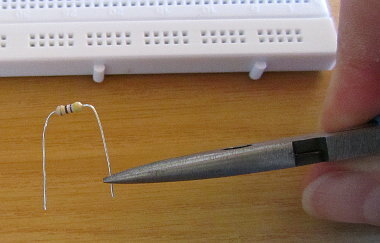 This problem of stiff breadboard tie points often occurs on new breadboards. 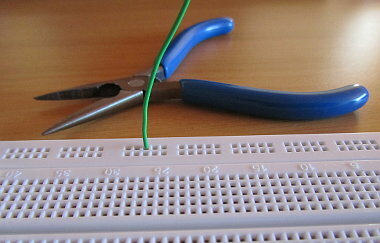 Here are some solutions and tips on how to insert components and wire into a tight breadboard. The first and most obvious point to check is that the wire is not too thick. If the wire fits into other tie points on the breadboard or is known to fit another breadboard, then this can't be the problem. Try to hold the wire or component lead lower down near its end when inserting. This will reduce the possibility of the wire or lead bending instead of going into the tie point hole. Using pliers with ridges on the inside of the jaws for gripping the component lead or wire is the best solution for really stiff breadboard tie points. Long-nose or similar pliers should do. This is illustrated in the images below and the video at the bottom of this page. Grip the wire or lead as far down as possible so that it won't bend on insertion. If the wire is already bent, the pliers can be used to straighten it first. The same goes for components, grip the component lead as low as possible before inserting it into the breadboard. 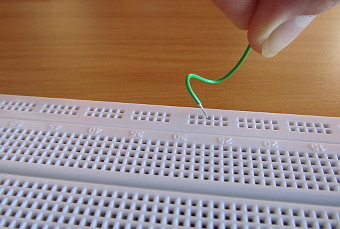 The following video shows a wire being inserted into a stiff breadboard by using pliers.